In some ways, the book of Job is like a Rorschach test. How we interpret it says at least as much about us as it does about it. Is God’s justice ultimately vindicated, or is that still an open question when we arrive at the end of the story? When did Job “speak correctly” about God (42:7): when he humbly submitted to God or when he dared to complain to God about his lot in life? There is one detail that many English versions seem to miss, but which is captured perfectly, I think, in the Common English Bible. In Job 42:6, Job says, “Therefore, I relent and find comfort on dust and ashes.” Most versions translate that second verb as “I repent” or something similar. It is, however, the same Hebrew verb used in Job 2:11, when Job’s three friends come to “comfort” him. Job’s friends could not comfort him. For that matter, after about three verses in chapter 2, it seems they gave up trying! Yet at the end, Job finds comfort—somehow—through his encounter with God in the whirlwind. God’s answer leads Job to “drop the charges,” as it were, against God’s perceived injustice. He at last comes to terms with the fact of his own limited understanding of the universe. Having now seen God for himself, he need no longer rely on the hearsay of his friends. Are Job’s questions answered? No, they are not. But Job has now seen God with his own eyes, and that seems to be enough. • What is the difference between the way Job spoke about God and the way his three friends did? • Is Job’s ultimate blessing meant to “repay” him for his previous suffering? If so, how is this a meaningful gesture? • What, ultimately, does the book of Job want us to understand about God’s presence in the midst of suffering? 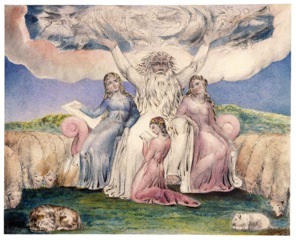 Job’s response to the speeches from the tempest indicates that he understands the implications of the rapturous description of nature and its creatures. Not one word is spoken about human beings, whereas God’s excitement over these wild creatures seems boundless. No wonder Job recognizes his smallness and abandons titanic ambitions. God’s further exuberance over mythic creatures of chaos, Leviathan and Behemoth, evokes yet another admission of finitude. Astonishingly, Job concedes that his prior knowledge of God came indirectly, as if by rumor, and acknowledges that his present knowledge derives from direct vision, which prompts him to submission of some sort. Does he now reject the serious charges against God’s manner of running the universe? Or does he abandon his fruitless effort to force a trial in which the Creator appears as defendant? James L. Crenshaw, “Job,” Mercer Dictionary of the Bible, ed. Watson E. Mills et al. (Macon GA: Mercer University Press, 1990), 454–55. God’s disclosure invites a transformation in Job’s understanding about what it means to be “dust and ashes.” By God’s design, the world contains unruly natural forces that may “oppress” creatures, like the waters that rage against Behemoth (40:23a). It also contains manufactured weapons that may wound or kill creatures, like those hunters use when pursuing Leviathan (41:1-12 [MT: 40:25–41:4], 25-32 [MT: 41:17-24]). Forces of aggression and violence do not however have the only say in determining the shape of God’s world. By God’s design and to God’s great delight, creatures that will not be subdued or dominated also have something to contribute. Some, like Behemoth, trust in their own indomitable power (40:23b) to shape the world as a place where all live in peaceful and contented fulfillment (40:20-22). Some, like Leviathan, laugh at danger (41:29 [MT: 41:21]) and live like kings who have too much pride to trade nobility for any role that makes them less than the creatures they were created to be (41:34 [MT: 41:26]). Having listened in as God celebrates the virtues of Behemoth and Leviathan, Job now understands that there is indeed a place in God’s world for creatures that refuse to submit to forces that would rob them of their dignity by reducing them to slaves to wanton misery. Like them, God has endowed human beings with power and responsibility for their domains. They too have been created to be fierce and unbridled opponents of injustice, sometimes with God, sometimes against God, even if it means they will lose the fight. As near equals of God, their destiny is to live at the dangerous intersection between the merely human and the supremely divine. When human beings dare to live out this mandate, their appearance before God as “dust and ashes” confirms their heritage as faithful descendants of Abraham. They may be sure that if they dare to live faithfully into their legacy, they will find themselves standing before a Creator who awaits and desires their arrival. They may speak words of praise; they may speak of words of curse. They may also risk moving beyond these levels of discourse to speak words of resistance and protest. But they must not be silent, for silence is unworthy of those who have stood in the divine presence and have learned that creation has been entrusted to them, because they are a “little lower than God.” In the end, to learn such a lesson may be the sum and substance of what Job says when he responds to God’s revelation by saying, “now my eye sees you.” It remains unclear, however, whether what Job now sees and understands is acceptable in God’s eyes. For the answer to this question, if it is to be found, the book directs readers to the epilogue. Samuel E. Balentine, Job, Smyth & Helwys Bible Commentary (Macon GA: Smyth & Helwys, 2006), 697–99. Darrell Pursiful is the editor of Formations. He is an adjunct professor at Mercer University and an active member of the First Baptist Church of Christ in Macon, Georgia. For further resources, subscribe to the Formations Teaching Guide and Commentary. Additionally, the Smyth & Helwys Bible Commentary series is a scholarly but accessible means for enhancing your study of each lesson. To purchase the volume quoted in today’s Reference Shelf, please click Here.